Few months back one of my friend has created a Ghost image of "C" Drive and yesterday when he was reinstalling Windows XP using the Ghost CD which he has created, after Ghost installation he saw that the D drive partition got lost and seemed to merge with C drive. He asked me for help that how to restore the lost partition and the data from lost partition D? The situation with a "lost" partition typically arises when Windows OS has been reinstalled or when a slave/external hard drive is moved to another computer. The following guide is written for Windows users that how to restore lost partition and restore data in it. To restore lost partition, first you need to know that that whether a partition can be recognized by system or not depends on the partition table and boot sector. If the lost partition shows up in Device Manager and Disk management, but NOT in "My Computer", chances are that it is "only" the partition table/boot sector that is missing or corrupt. So the partition seems lost and the files in it become invisible. 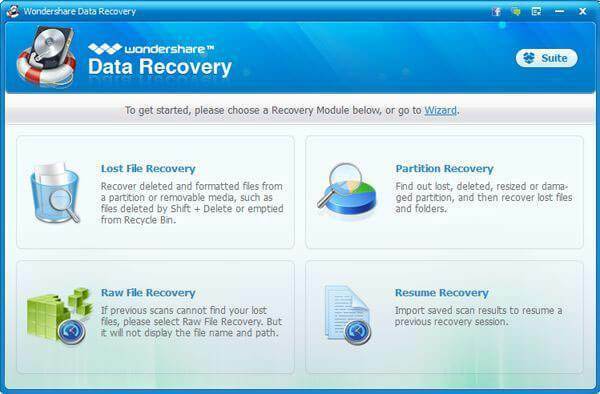 You can use the Partition Recovery module of Wondershare Data Recovery to restore lost partition table and get access to your data in that lost partition again. It will not change or write on your hard disk so you can use it at ease. Here let's take the Windows version as an example. 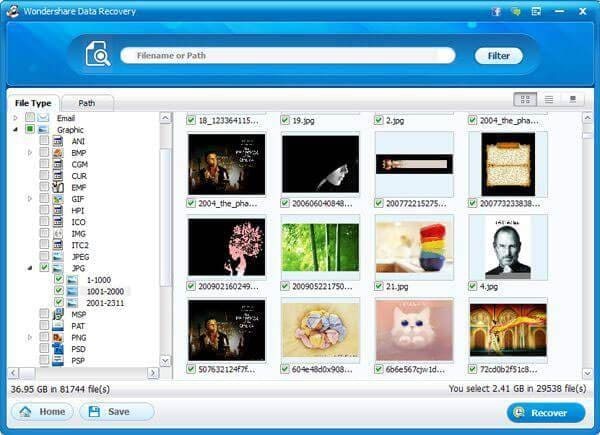 Launch Wondershare Data Recovery, select Standard Mode, go to Partition Recovery on the main interface. 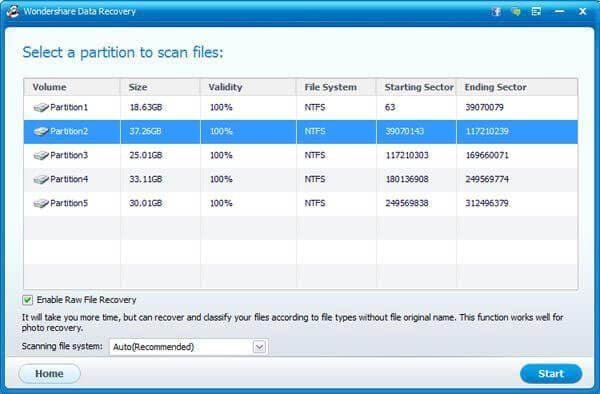 This Partition Recovery can find back your lost, deleted or damaged partitions, as well as the data stored on it. 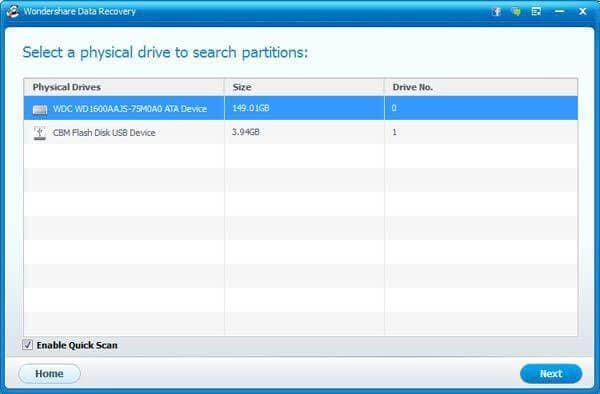 Select a physical drive where you lost your partitions. Then click on "Next" to scan your lost partitions. When the scanning completes, all your lost partitions on the disk will be displayed, and now you only need to select one that you are going to recover by hitting on "Start". Now you are here to recover the lost data on the partition. If the partition is large, it'll take you a quite long time for scanning. After the scan, all the results will be automatically organized in file types. You can check them all for recovery, or get them back selectively. Before doing the recovery, you can preview photos, Words, PDF, PPT, ZIP files, etc. to check the quality and confirm whether you need them back or not. When you are recovering, please save them on another disk, in case you overwrite the disk. If you don't find back the files you want, you can try it in other ways. But if you overwrite your disk, the files will be permenantly erased. Switch to the Wizard recovery mode. Check "All Files" and "Whole Computer" to start scanning. After the scanning finishes, you will get a list of all recoverable files as above. Choose the ones you need and continue.